Introduced last year, the 2019 Audi A5 Sportback remains a highly recommended four-door coupe. While the A5 Sportback's hatchback design and outstanding fuel economy make it extremely practical, a punchy engine gives it a fun-to-drive factor. Sharp styling is another one of the A5 Sportback's highlights. While there are plenty of standard features inside the new A5 Sportback, some buyers will by intrigued by the sedan's premium options. Despite its outstanding reviews, this car is not perfect for everyone. Should you spend the money on a new 2019 Audi A5 Sportback? With the A5 Sportback being such a new model, Audi decided not to make any major changes. However, a new Black Optic appearance package has arrived. Very few cars in the segment deliver a better marriage of performance and fuel savings. Under the hood of the 2019 Audi A5 Sportback sits Audi's popular 2.0-liter, turbocharged four-cylinder engine. Its 252-horsepower output helps push the sedan to 60 mph in a competitive 5.7 seconds. A seven-speed automatic gearbox aids the car's ability to get up and go. With a combined fuel economy rating of 27 mpg, the S5 Sportback easily ranks among the most frugal cars in the class. Not only does the 2019 Audi A5 Sportback look like a sporty coupe, but it also drives like one. A four-corner, five-link independent suspension helps the A5 Sportback to feel incredibly athletic. While the car's good ride quality makes it good for long-distance cruising, it can also conquer twisty roads with no problem. By using the A5 Sportback's Audi Drive Select system, you can adjust the steering feel to match your preferred driving style. Even in its standard form, the 2019 Audi A5 Sportback will engage most drivers. However, pure driving enthusiasts may crave just a bit sportier character. Luckily, Audi offers some worthy performance upgrades for the new A5 Sportback. When equipped with the optional active suspension dampers, the A5 Sportback feels more like a genuine sports sedan. High-performance summer tires further improve grip. An adaptive steering system is available as well. Unlike the overwhelming majority of the competition, the 2019 Audi A5 Sportback comes standard with an advanced AWD system. Furthermore, Audi's famous Quattro AWD system is among the best in the entire industry. It seriously aids traction without causing a noticeable drop in efficiency. When driving home on a snowy day, Quattro will give you more confidence. While Quattro is famous for performing well in wet weather, it's also designed to promote better cornering. Although the 2019 Audi A5 Sportback is shaped like a coupe, it gives you the practicality of a sedan. Many car fanatics like the A5 Sportback's sloping roof and broad stance. This car definitely has a sporty profile. Like a true performance car, the A5 Sportback comes equipped with dual exhaust outlets. Audi's Singleframe grille gives the A5 Sportback even more style. A cooler set of 19-inch five-spoke wheels are available as an option. While the A5 Sportback is a very clean-cut automobile, some buyers may want to further set themselves apart. Getting the all-new Black Optic appearance package is a great way to give the sedan a special touch. It will definitely get plenty of stares. Brilliant Black exterior trim makes the A5 Sportback look phenomenal against a scenic background. Featuring a titanium finish, the Audi Sport wheels give the A5 Sportback an even cooler appearance. When sitting behind the wheel of the new A5 Sportback, you'll enjoy hours of comfort on the highway. If you like to travel on the weekends, this car may prove to be your perfect companion. It's well-shaped seats will keep you comfortable and supported. Summer road trips are made more relaxing with the optional ventilated sport seats. There's also enough legroom in the front for tall folks. Audi offers a number of safety technologies for the new A5 Sportback, including adaptive cruise control with traffic jam assist and steering assist. However, the sedan's most helpful driving aid comes standard. When your approaching a vehicle, Audi Pre Sense City can activate your brakes. It makes driving in bumper-to-bumper traffic a lot less unnerving. Audi Pre Sense City also keeps an eye out for pedestrians. Audi's Virtual Cockpit is an option that's worth the extra cash. It replaces the standard instrument cluster with a high-resolution digital screen. You'll be able to customize the digital gauges to your likely. When traveling, the Virtual Cockpit can display a large map with colorful details. Drivers will love having easy access to navigation directions. If you love technology, Audi's MMI infotainment system with Apple CarPlay and Android Auto will make your day. A control knob near the center console enables you to select apps. Not only does the MMI interface get high marks for its easy operation, but users also like the placement of its screen. While the standard MMI system is nice, the upgraded version features a larger 8.8-inch screen with handwriting recognition. 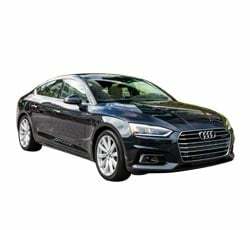 With a starting price of more than $45,000, the 2019 Audi A5 Sportback is more expensive than some of today's other luxury hatchbacks. The upper trims are even pricier. Some car shoppers will be more tempted by the less costly 2019 Buick Regal, which has an MSRP of $25,200. Meanwhile, prices for the highly touted Kia Stinger start at almost $33,000. Some great safety features are offered on the 2019 Audi A5 Sportback. Unfortunately, some are only available on the range topping Premium Trim. Smart cruise control, lane departure intervention, and traffic sign reading are not available on the lower trims. These features are found in the Prestige trim's optional Driver Assistance package. Some car buyers may not want to pay the extra cash. Audi's S-tronic automatic transmission is great. Nevertheless, some drivers will be looking for a car with a manual transmission. Sadly, Audi does not offer a stick shift for the A5 Sportback. If you want a manual transmission, check out the two-door A5 coupe. It does not drive very different from the A5 Sportback. While the 2019 Audi A5 Sportback is more practical than a two-door coupe, it's still not the best option for a growing family. Its backseat doesn't provide the most legroom. Although small backseat passengers will have no issues, taller folks are prone to bumping their knees. If you're worried about passenger room, step up to the larger A7 Sportback. Steering-wheel-mounted paddle shifters come standard on the new A5 Sportback. They alloy you to manually sort through the gears. Unfortunately, they are a tad on the small side. Drivers with large hands may have trouble using them. The 2019 Kia Stinger is a great alternative to the 2019 Audi A5 Sportback. It's nimble, fast, and packs a 100,000-mile powertrain warranty. Most importantly, this car is thousands of dollars cheaper. However, you'll find the A5 Sportback to have a nicer interior. If you desire a luxury sedan with a hatchback, don't dismiss the 2019 Buick Regal. A well-equipped Regal can easily be hand for less than $30,000. In terms of driver engagement, the A5 Sportback is a step ahead. The BMW 4-Series Gran Coupe is also a good option. It stacks up well to the A5 Sportback in several areas, including price. However, there's more cargo space in the back of the A5 Sportback. The 2019 Audi A5 Sportback is a fine automobile that deserves a serious look. It gives you good a amount of performance and satisfying fuel economy. Audi's Quattro AWD system is also hard to beat. Because of the A5 Sportback's tight backseat, tall families should hesitate to buy one. Furthermore, you can't get the 2019 A5 Sportback with a manual gearbox. • Why Buy a 2019 Audi A5 Sportback? • Why Buy a 2019 Audi A6? • Why Buy a 2019 Audi A7? • Why Buy a 2019 Audi Q3? • Why Buy a 2019 Audi Q5? • Why Buy a 2019 Audi Q7?